We are lucky here in Frederick County and throughout the U.S. to have working plumbing and clean drinking water in our homes. This Friday, March 11th is World Plumbing Day, a day to promote awareness about the important role that quality plumbing plays in our country and the rest of the world. In the United States, there are over 18,000 municipal wastewater treatment facilities serving 75% of our population, while the remaining 25% use septic and other on-site systems. We also have a public drinking water system that provides treated drinking water to 90% of U.S residents. It’s important that we don’t take this luxury for granted, as those in third-world countries do not have clean water to use for cooking, drinking, and washing their hands. The World Plumbing Council’s mission statement is “To promote the role of plumbing in improving public health and safeguarding the environment by uniting the World Plumbing Industry for the benefit of all.” Plumbers all over the world work hard every day to provide basic necessities to needy populations, and it’s important to recognize their efforts. Thank the plumbers around you, and do your part by conserving water and energy. Awareness starts with our youth, so you can teach the children around you to appreciate the clean water they have. 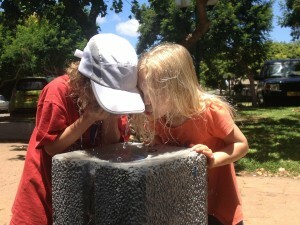 Teach kids in schools and in your home that water is too precious to be wasted. Tell them to take shorter showers and not to leave the water running while brushing their teeth. Let them have fun playing in the sprinkler, but only while it’s also working to water the lawn. When doing their chores, make sure kids are fully loading the dishwasher before starting it, and to use the correct washing machine setting when doing loads of laundry. Energy efficient appliances have come a long way in the past few years to reduce not only water usage but also power usage. When you’re ready to purchase new appliances, consider buying high efficiency water heaters, dishwashers, washing machines and boilers to use less water and lower your bills. Your child is invited to participate in an international poster contest that could win him or her money for the school and the student. To download the poster and see rules, click here. We at Putman Plumbing in Middletown are so happy to help provide clean water and sanitary conditions in homes, schools, and businesses throughout our area. We thank you for your business, and hope you’ll do your part to promote the importance that quality plumbing plays all over the world.